Weight Watchers is an ever evolving diet program that provides its users with the necessary tools to become and maintain one’s best version of him or herself. In 2010, Weight Watchers revamped their weight loss, calling the program Weight Watchers 360º, which includes the PointsPlus® plan. A little background on Weight Watchers, not only provides tips and suggestions on how to to healthy, but emphasizes the importance of physical activity, healthy habits, utilizing support and making smart food choices. Weight Watchers is flexible, with one able to follow the program by going to an onsite program and/or using the resources at home. If one decides to join Weight Watcher’s, there’s a free assessment, which provides Weight Watchers a better idea of how the program can best benefit the customer. By inputing one’s age, gender, height, and current weight, Points Plus will be assigned and BMI will be reported. Weight Watchers have not only listened to past participant suggestions, but have stayed in tune with ever changing technology and have utilized technology to their benefit. 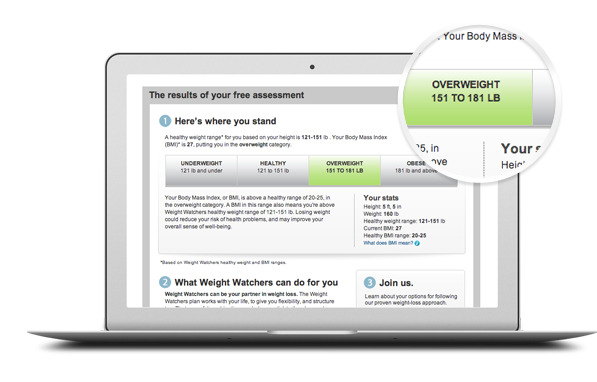 Weight Watchers has made strides, implementing Weight Watchers 360º. Encouraged to eat choosing more “Power Foods.” For example,whole grains, lean meats, low-fat dairy, and unlimited quantities of fresh fruit and nonstarchy vegetables. They’re the healthiest, most filling foods. Points Plus would assign 30 daily points plus and 49 points plus weekly allowance. Compared to the new pointing system, the old point system provided 22 daily points and 35 weekly allowance. My favorite part of Weight Watcher’s is their emphasis of being aware of what one is consuming on a regular basis. A lot of other diet programs emphasize what one can’t and can eat. However, with Weight Watcher’s one can have that donut, it’s just calculated into your daily food points. Check out Weight Watcher’s at: http://www.weightwatchers.com/ and take advantage of the free recipes, tips, newsletters and endless resources! Lastly, I found this website’s meal breakdown for a day. It proves Weight Watcher’s commitment to providing edible, nutritious food while staying within the recommended Daily Recommended Intake (DRI) for individuals. Next Soy You Want More Protein? I believe it depends on what you’re writing about and how much time you want to dedicate to writing in your blog will dictate how much time will be needed for the blog. I enjoy writing in my blog, but I try to be as factual as possible, which requires more time to research than if I were to write in my diary. I hope this answers your question. Let me know if you have any more questions. Best of luck.